The other publication was getting too long. It's time for a new one. I'm going to leave this publication "Neutral" for now because future price moment depends on what occurs with the indicators and the price action over the next 24 to 96 hours to dictate the general direction we're going over the next two to three weeks following. It's still currently looking like we have more indication of downside pressure to be prolonged instead of upward pressure. However, at times like this when we have the potential for a change in trend from bear to bull after 7 months of bear trend it can be tricky to determine when reversal in trend has set in. I still find it hard to believe Composite Groups (whales) will allow us to go below $5,774.72 on Bitstamp . Mainly because I find it hard to believe they will allow those who lost capital from bad trades the opportunity to get back what they lost with a low entry. 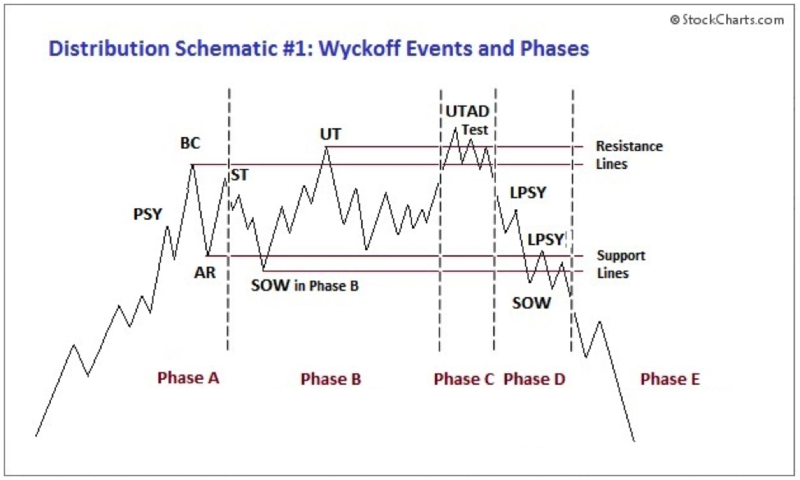 I'm still leaning more towards a Wyckoff Accumulation Schematic #2 rather than Accumulation #1. A Wyckoff Accumulation Schematic #1 is still possible. However, if it's going to come to pass, we need a price pump up to $12,500 at a minimum to show "Sign of Strength" before reversing back down on a "BU/LPS" to around $8k. I have a hard time seeing that taking place at this point but it's still possible. I'm leaning more towards the ODDS of Accumulation Schematic #2. LET US SEE HOW HIGH THIS NEXT MOVE UP IS GOING TO BE TO HELP US DRAW A BETTER CONCLUSION OF WHERE WE GO FROM HERE. Comment: When I first posted this publication, it looked like there was a "chance" for a brief upward spike before continuing downward. It currently does not look like that is the case now. At least not up to the price level I had the red line with arrows drawn when first posting this publication. 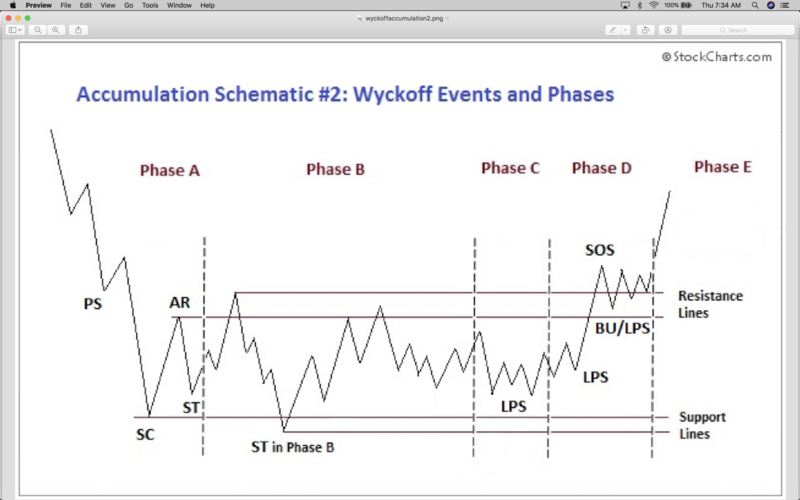 The Red arrows Provide example for Wyckoff Accumulation Schematic #1. 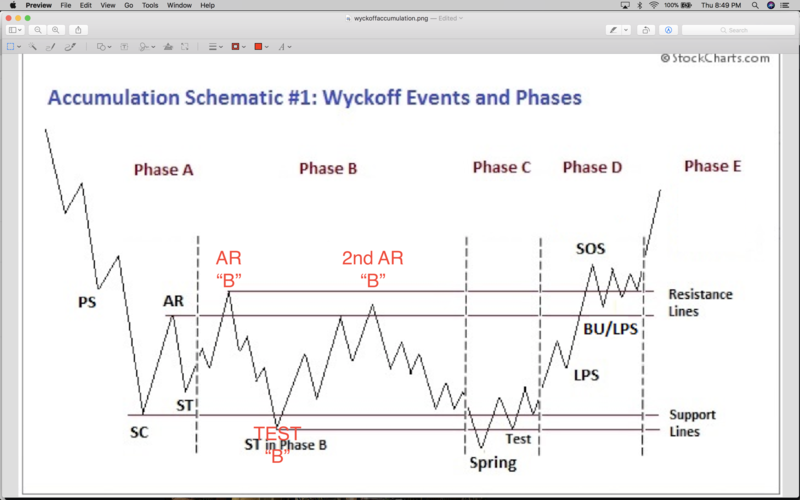 The Black arrows Provide example for Wyckoff Accumulation Schematic #2a. The Blue arrows Provide example for Wyckoff Accumulation Schematic #2b. We sill need a bit more time to determine which one it may be from lower TF's (1440m, 720m and 360m). "I would like to ask a question about the wyckoff bitcoin schematic (1) we are in. But first I would like to thank you for your extensive analyses and updates. I saw another analysis where someone said the "test" is yet to come. When I asked why he thought the "test" is yet to come and didn't already happen, I didn't get a straight answer. Can you explain to me why we already must have had the "test" ? Thanks in advance. Have a nice day!" I'll provide two example charts on my BTCUSD chart within the next 2 to 4 hours. If one looks at the 2-Day TF, we could conclude the Test AFTER the Spring has already occurred. IF one looks at the 7-Day TF, we could conclude we are currently working on the Test AFTER the Spring. That's providing we are in a Wyckoff Accumulation Schematic #1. We COULD be in a Wyckoff Accumulation Schematic #2. We need to see what plays out the remainder of August to determine if we are in Accumulations Schematic #1 or #2. If one looks at the 2-Day TF, we could conclude the Test AFTER the Spring has already occurred AND we are currently working on a Last Point of Support (Testing Support) before continuing upside. This assumes we are in Wyckoff Accumulation Schematic #1. However, we could be in an Accumulation Schematic #2. Something like this example provided in this chart needs to occur for Wyckoff Accumulation Schematic #1 to be validated. Following up with an example of Accumulation Schematic #2 shortly. Comment: Here's both Accumulation Schematic #1 and #2 on same chart. I will follow up with worse case scenario shortly; which will be Distribution Schematic #1. Sorry if this chart is too "busy"
Comment: I personally find it very hard to believe we are at the end of a Distribution Schematic #1 with a Selling Climax; to mark the Beginning of an Accumulation Schematic with an Automatic Rally afterwards in Phase A. Either we are about to have a month or two of bullish moves in Alt-Coins while BTC goes bearish into a Selling Climax and mark the beginning of Phase A in an Accumulation Schematic. We are about to have a reversal with BTCUSD along with the alts; which would confirm BTCUSD is in either an Accumulation Schematic #1 or #2. Why does Goldman Sachs hate everyone so much? I'll be glad with you if you check my TA using wickoff method for BTC and tell me what do you think about it.. This "is" looking more and more like a "Test" AFTER a "Spring" when using the 5-Day TF or higher. We SHOULD see a reversal between now and this weekend. This week is enough. in the past i lost A LOT, but A LOT of money overtrading. I will do nothing, just watch the market and the sunday analysis again and make my trading plan for the next week... but of course i will follow your post the only coherent trade i found here in tradingview..
Do you think that the three different scenarios could be correlated with the upcoming ETF news? Red would mean SEC allows ETF, Black would happen if they postpone the decision, and Blue would happen if they reject it? @Dontlosemoney, Apparently the decision was delayed. Okay, didn't realize that. Then we could be looking at Accumulation Schematic #2 or Distribution Schematic #1. I should have said, "Then we could be looking at Accumulation Schematic #2 or THE END of Distribution Schematic #1 with a Selling Climax to mark the beginning of an Accumulation Schematic in Phase A."